Let's be honest, sometimes a girl just wants to be comfortable, am I right? Today's post is dedicated to those ladies who struggle with dressing cute because all they want to do is be comfy. (This is me every day). Not many things are comfier than a maxi dress, and this dress is no exception. It literally feels like you are wearing a nightgown! The best thing about maxi dresses is that it looks like you put effort into your outfit, when really all you did was throw on a dress! You have the comfy part down with the dress, now you have to make it cute! I added a pair of statement earrings and a pair of fun sneakers to complete my look. The best thing about KEDS is that they are in line with the cute and comfortable trend we're going with! The sale runs from 4/12-4/14 for Shopbop and 4/12-4/16 for East Dane. I have also rounded up some of my favorite items from the sale below! Those sneaks are SO fun! Those shoes are AMAZING! I have sparkly Keds, too, but they're dark purple--the silver looks so much more glittery! THAT black dress is SUPER cute - I love the longer length in the back too! This summer I am finally going to accept the sneaker and dress trend, because I'd like a summer where my feet arent killing me! I love this look! So great! First, I love the title of this post because it is so me. I love how you styled this and I think I really need those sneakers! Now this is my kind of post! I always want to be comfy and stylish! and you can definitely do both! Omg these are the cutest Keds! I need to check these out! That is my kind of look, it's super cute and super low maintenance. I especially love the shoes, super cute! Dressing cute and comfy is my life goal. I wore these keds for my wedding reception! Beautiful!! I'm loving your style! Specially that colorful bag!! I am all about the comfort! That maxi looks perfect! I love your glitter shoes! You accessorized this dress so well with such fun accessories. This is adorable! I am all about comfort! Love these sneakers! love how you paired this dress with sequin sneakers, so unexpected and chic! Love your black dress!! Looks super comfy and stylish. This is SUCH a cute look! I'm all about being comfy and cute and this look nails it! Such fun sneakers too! Such a cute and comfy look. That clutch is so cute! Love those shoes - so fun and perfect for a night out! That shoes is super cute! I should get one of them too. Sneaks with dresses is a favorite combo of mine! You nailed this look!! This entire outfit is amazing, I love sneakers with dresses and the sequins just make it absolutely perfect!! Stretchy dresses and sneakers are my jam I have a pair of sparkly TOMS though for some reason I've never paired those shoes with a dress before. I always use my converse. 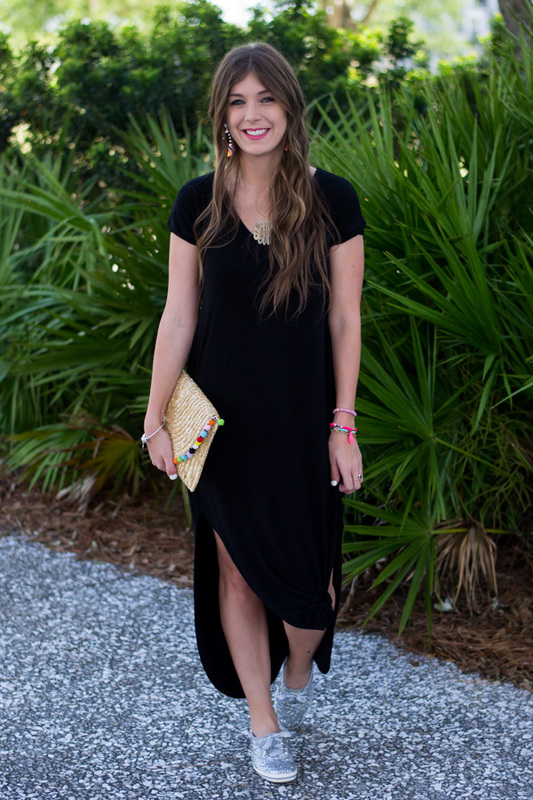 Love the comfy dress and love how you styled it! Your shoes & clutch are too cute! I have those shoes in white. I wore them for my wedding in October on the dance floor! They are so much fun and I love them!